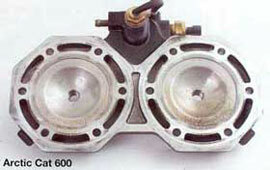 AMSOIL INTERCEPTOR Synthetic 2-Cycle Oil is recommended as an injector oil or at a 50:1 mix ratio in carbureted, electronic fuel Injected (EFI) and direct fuel injected (DFI) snowmobiles, personal watercraft, motorcycles, ATVs and jet boats, including, but not limited to, those manufactured by Bombardier ®, Yamaha ®, Arctic Cat ®, Polaris ®, Kawasaki ®, Suzuki ® and Honda ®. AMSOIL INTERCEPTOR ™ Synthetic 2-Cycle Oil (AIT) is formulated with a proprietary blend of the finest synthetic base oils and additives available today. This unique AMSOIL Chemistry represents a breakthrough development in the field of two-cycle engine lubrication. 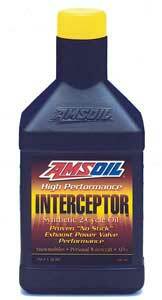 The backbone of AMSOIL INTERCEPTOR 2-Cycle Oil is a specially developed molecularly saturated synthetic base oil. This, combined with a robust additive package, ensures exceptional lubricity, cleanliness and optimum clean-burning characteristics. Extensive research and testing, including a full snowmobiling season in severe Rock Mountain applications, has proven that wear on cylinders, pistons and bearings is significantly reduced. And with up to 30 percent more detergency and dispersancy additives than typical two-cycle oils, AMSOIL INTERCEPTOR virtually eliminates hard carbon deposits that cause exhaust power valve sticking, ring sticking and pre-detonation promoting "hot spots" in the combustion chamber. Provides exceptional SAE #4 cold temperature fluidity (-58ºF pour point).